I love Canada...but it can get really cold up there. October 2017 was a busy month: it started with me flying to Vegas for the dramatic home opener of the Golden Knights, and was quickly followed by seeing HAMILTON on stage and Arcade Fire in concert, so I looked to November instead. From the moment I devised "The Quest", I had every intention of using my Winnipeg trip as a chance to drive to nearby Brandon to see the WHL's Wheat Kings in action, knowing that the odds of ever being in that part of the world again were slim to none. As it so happened, there was a stretch during the first week of November in which the Wheat Kings and Winnipeg Jets were playing on back-to-back nights on the same weekend, so I penciled that into my schedule and set forth with the planning. 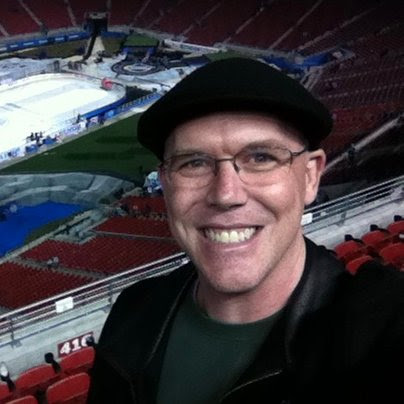 My travel companion Chad had no real interest in seeing Brandon, so I decided to fly up ahead of him and acclimate myself to the surroundings until he arrived for the Jets game. I'd done my research and found that there weren't too many tourist attractions in Manitoba that called out to me, so I knew my time away from home would be brief - this was well-received by my fiancee, as she passed on coming along for fear that she would be bored. 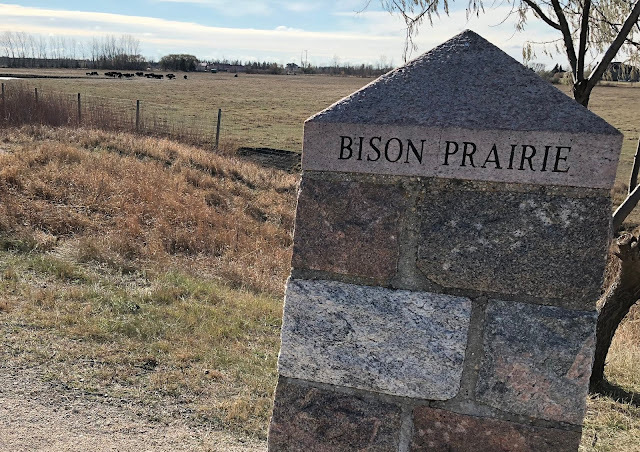 Traveling alone, it wound up being a very calming trip that allowed me to simply enjoy the tranquility of the vast prairie, which is always a welcome change from the hectic life I have in Los Angeles. And away we - I mean, "I" - go! I checked into my hotel and looked for a place to eat, ultimately settling on Tavern United in Polo Park, a pleasant British-themed sports bar connected to another hotel (Canad Inns). The food was delicious, and I was able to watch a live Jets game on TV, before I headed out to grab some groceries and return to the hotel for the night. There was one particular attraction that immediately stood out when I researched the city of Winnipeg: FortWhyte Alive. A sprawling nature preserve nestled just outside of the urban trappings, this would serve as my moment of zen. I arrived in the morning and spent nearly three hours walking around every inch of the open space, and though it was quite cold, the multiple layers of clothing on my body kept me just warm enough to truly appreciate the surroundings. I watched as geese frolicked on a frozen lake. I observed bison relaxing in a quiet field. In a sense, I became one with the habitat. It was incredibly moving, and made the entire trip worthwhile. 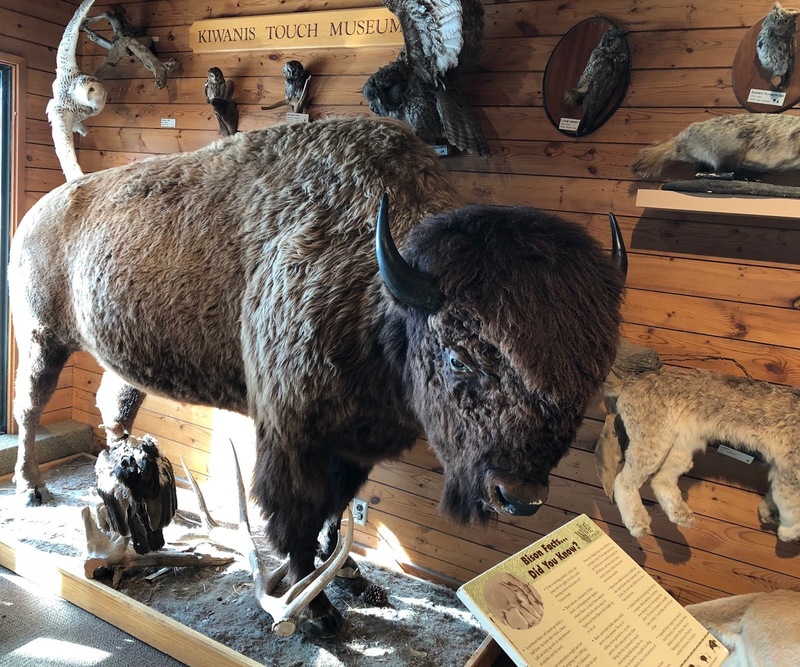 Back inside the gift shop, I marveled at the sight of a "touch museum", which encouraged visitors to feel the hides of the various animals that roamed the area. It was both weird and interesting, just as one would imagine. But now it was back to civilization, as I ventured off for the two-hour journey along the Trans-Canada Highway to Brandon. I wanted to avoid the usual fast-food restaurants and experience some of the local charm, so I had dinner at Smitty's - a casual diner that was the perfect spot to unwind after the long drive. My next stop was the Keystone Centre, home of the Wheat Kings. 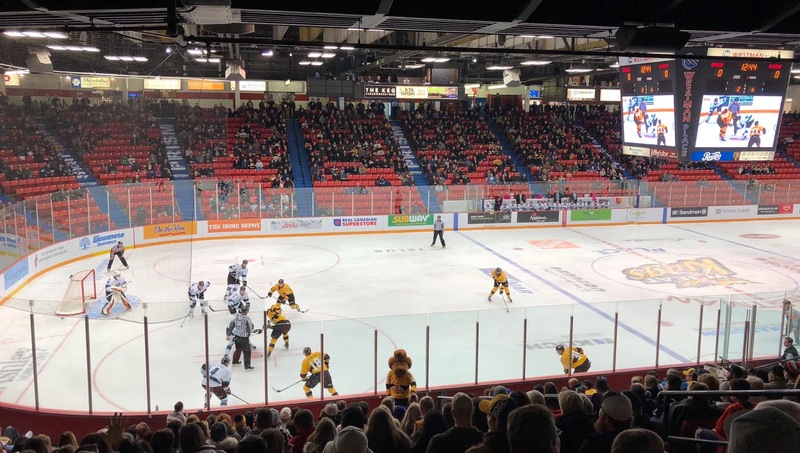 With each passing year, I become a bigger fan of junior hockey: other than the occasional game on the NHL Network, we hockey fans in America are mostly shut out from seeing the Canadian Hockey League, so I try to take advantage when I'm up north. 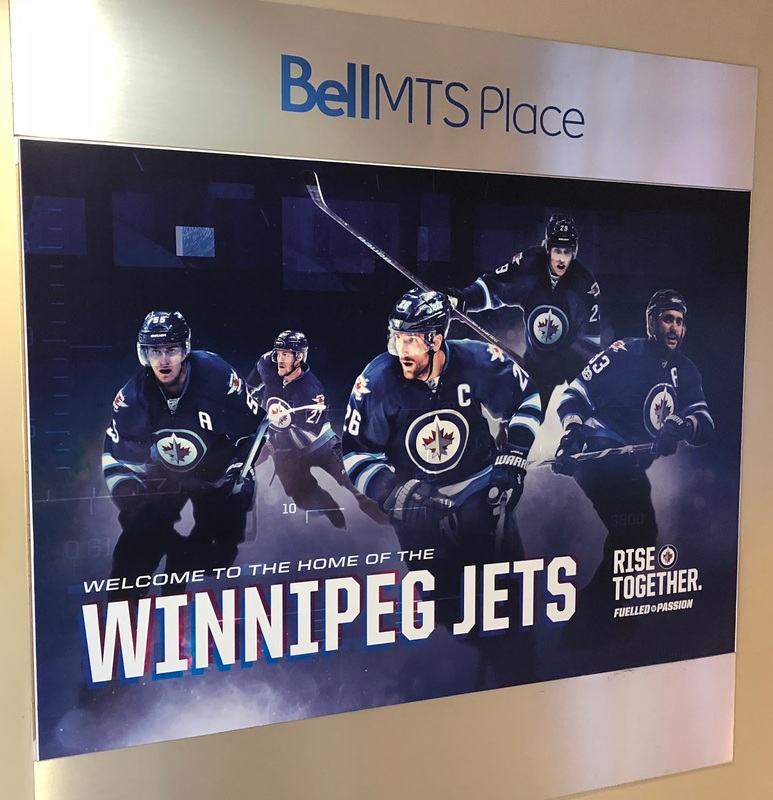 From the moment I walked in, it just felt like home: I had a great time walking around the concourse, chatting up the retired couple sitting next to me, and making conversation with the employees in the team store. Just like with FortWhyte Alive from earlier in the day, I just didn't want to leave. The game itself was fun, and even though the visiting Kootenay Ice jumped out to a 4-0 lead in the first period and never looked back, I still enjoyed every minute. I descended into the freezing climate outside, carefully treading across the snow-covered parking lot. The drive back to Winnipeg would be long and boring, yet peaceful. When I arrived at the hotel, I was greeted by the receptionist who gave me a poppy to wear in honor of the upcoming Remembrance Day holiday, which I pinned to my coat with pride! Chad arrived early in the morning, just at the onset of a full-on snowstorm striking the city. So much planning and preparation, and the ONE day I have to experience Winnipeg would happen in some of the most adverse weather conditions we'd ever encountered on any of our road trips. I couldn't help but feel somewhat bitter, but I tried to make the most of it. We braved the elements and headed downtown - our first stop would be The Forks. 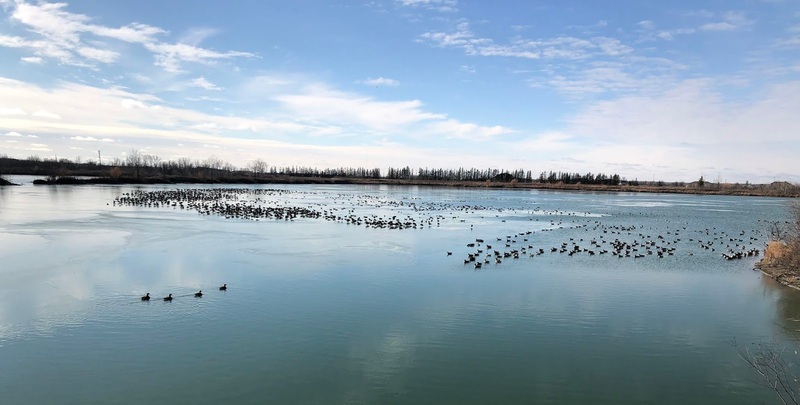 A massive site that should be a high priority for any visitors to Winnipeg, this historic location has served as a "meeting place" for hundreds of years, with some archaeologists even claiming that Aboriginal people came to The Forks almost 6,000 years ago! Unfortunately, the heavy snowfall prevented us from seeing most of the premises, and we were relegated to staying indoors at The Forks Market. 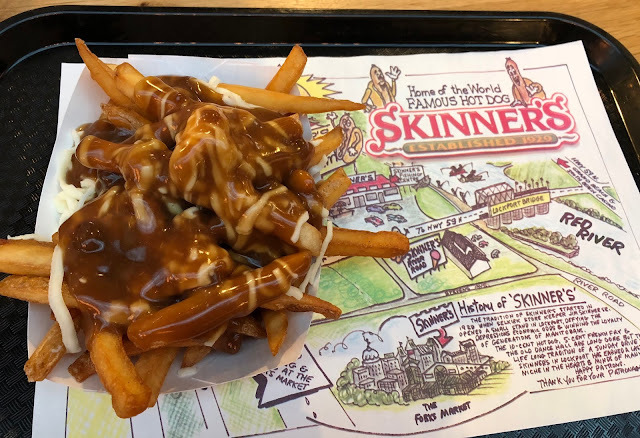 It was a nice enough way to waste some time, and I finally got to have some terrific poutine from Skinner's. The snow had begun to slightly dissipate by the time we arrived at Bell MTS Place, home of the Jets. 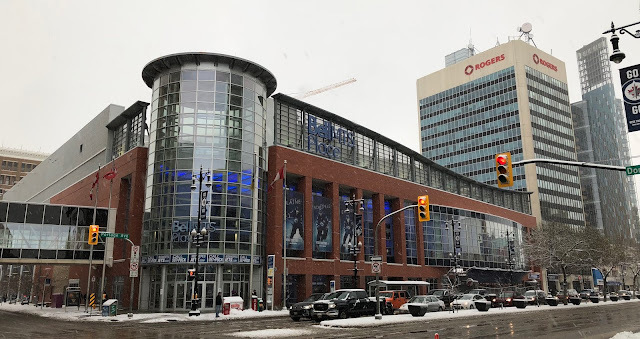 The game would start at 6pm due to being a national broadcast on Hockey Night in Canada, and we wanted to make sure we were close enough when the arena doors opened, so we decided to walk around the immediate area near Portage and Main. This also gave us the chance to do some shopping at the team store and return our purchased items to the rental car before the game started. The time quickly flew by, the doors opened and we made our way inside - and with an extended amount of time before the opening faceoff, we knew this was our opportunity to find the mascot. Behold...Mick E. Moose! The Montreal Canadiens were in town, and they'd be playing in front of MANY of their own fans. Honestly, I wouldn't have had it any other way, as it created an excellent atmosphere for a fantastic game! 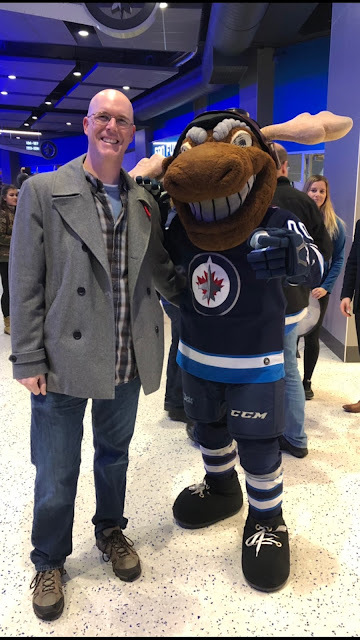 I also got to take part in one of the NHL's great traditions, shouting "TRUE NORTH" with the Jets fans as those lyrics from O Canada resonated in the air. 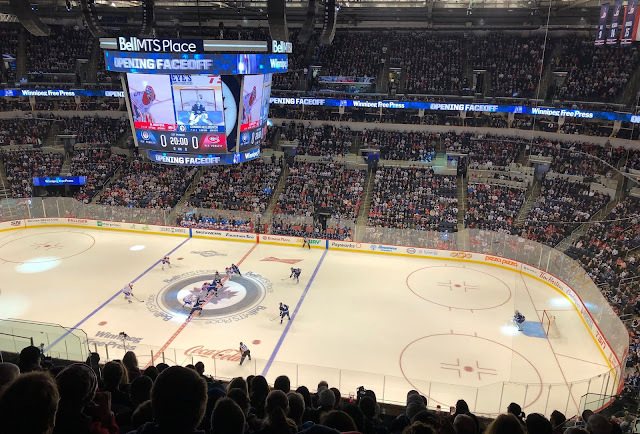 The game was fast and furious from the start, with the Canadiens relentlessly chipping away throughout the opening period - the Jets would strike first though, taking advantage of a Montreal penalty with Patrik Laine capitalizing on the power play. My last name on the scoreboard?!? Nice! 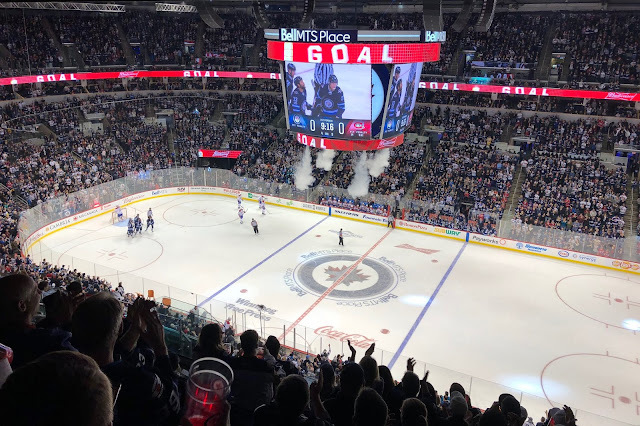 Power play markers from Nikolaj Ehlers and Blake Wheeler propelled Winnipeg into the lead, though Montreal soon stormed back to tie the game on an unassisted goal from defenseman Jeff Petry with less than five minutes to go in regulation. Montreal had seized the momentum and was dominating the game, but could not solve Jets goalie Connor Hellebuyck. The game would need overtime to determine a winner, but could Winnipeg hold up? 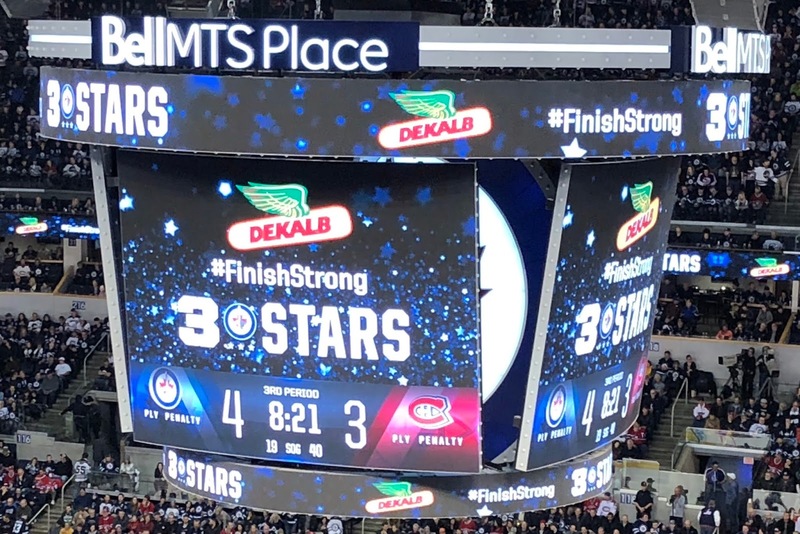 Hellebuyck had faced 46 shots(! ), while the Jets had only mustered 20 of their own. Two minutes into the extra period, Winnipeg's Tyler Myers was whistled for a cross-checking penalty, and that was just the break the Canadiens needed: captain Max Pacioretty took a beautiful feed from Alex Galchenyuk behind the net, and slipped a one-timer past Hellebuyck for the game-winner. 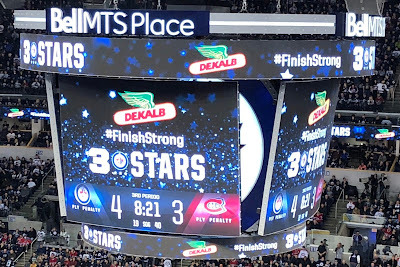 It may not have been the result the home team wanted, but it was one of THE most thrilling games I'd ever seen - both teams played their hearts out, and the fans were the lucky recipients. The memory was still fresh in my mind as we drove back to the hotel, listening to a post-game show on one of the local radio stations. My trip had been all-too-brief, and even though the weather played a larger factor than I would have preferred, it was still very satisfying on a personal level. I'd seen nature at its finest, while being embraced by the wonderful spirit of the Canadian people. There will always be a place in my heart for my neighbors to the North! Success! I was able to find shot glasses at the team stores in both Winnipeg AND Brandon - plus, I got this cool puck commemorating the 50th anniversary of the Wheat Kings franchise. Eight games. Nine days. Two countries. One massive trip racking up almost 2,000 miles on the road.